What's cooking? Here's a sneak peak of what you may find soon on the blog. Recently I stumbled upon a magazine article that detailed the steps to make your own vinegar from leftover wine. What a wonderful idea! I'm sort of obsessed with any kind of "make it yourself" food project. I earmarked the page, determined to try this myself the next time we had some leftover wine. Well, the time has come. 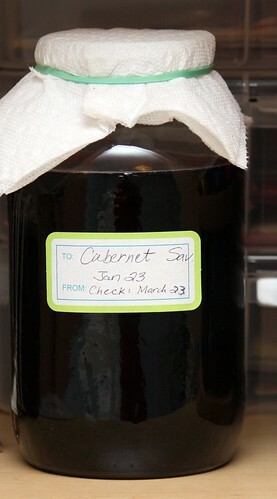 The day after opening a bottle of ridiculously inexpensive Cabernet Sauvignon, it tasted...well, terrible. I couldn't make myself finish the bottle. Remembering the article I read, I decided to try my hand at making my own vinegar. I did some research online and lots of articles and blog posts recommended adding a "mother" -- a slimy biproduct of vinegar production that helps to kickstart the fermentation process. I didn't have a mother...well, not that kind and a few articles mentioned that it's not entirely necessary. Eager to start my vinegar experiment right away, I decided to forgo the mother. Hopefully, my own vinegar will begin to form its own mother soon enough. Another tip was to use a jar with a spigot. (This allows you to taste the vinegar without disturbing the "mother" that rises to the top.) I don't have one of those either. Alas, the show must go on! I pulled out a canning jar that I had just washed after using the canned tomatoes from this past summer's "Project Lotta Tomata". I poured the left over wine into the jar and diluted it with some water, as suggested by Ted in this article. 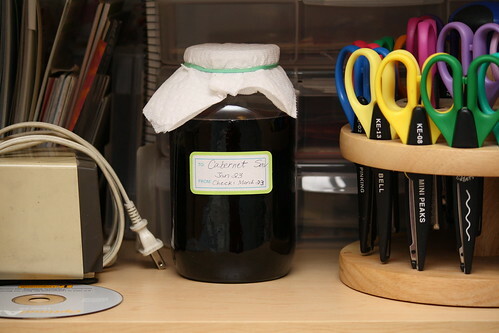 The jar, covered by a paper towel to allow oxygen in and to keep flies out, needs to be stored in a warm, dark place. Hmm....my tiny kitchen doesn't have a single corner that is not being used. Plus, the thought of vinegar spilling out when I (inevitably) bump it while reaching for some pot or pan makes me cringe. Here's a short video from Chow.com I watched that simplifies the process. Enjoy!